The aim of the project is to contribute to raising the levels of understanding of ICT and embedded systems for Vocational Education and Training (VET) students and continuous education of professional workers in a broad field of engineering domains. This was done by transferring the innovative study concept, namely “ Learning Situations “, from Germany to the Nordic/Baltic European region (mainly Estonia, but also to Finland and later Sweden), by adopting the product to Estonian needs and bringing them to the Internet learning environment. The main outcome of the project is adopted “Learning Situations” which can be used either in a conventional learning environment or through distance learning in e-environment. 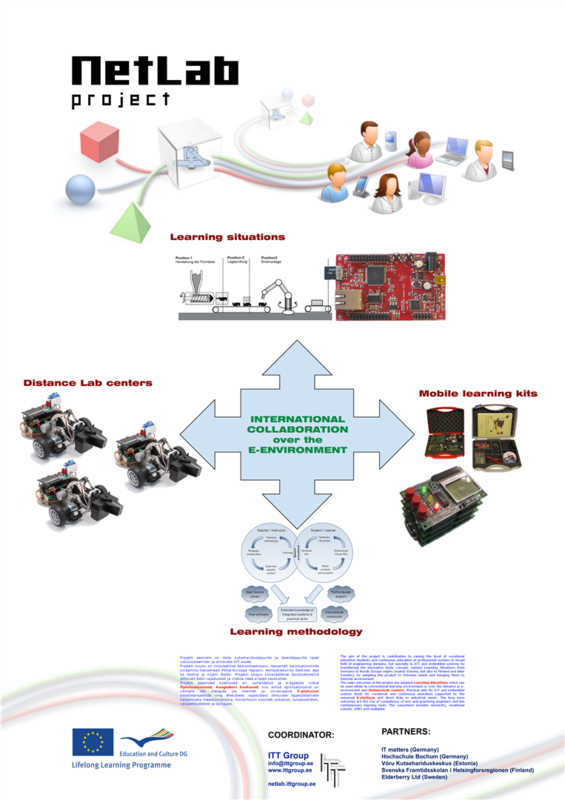 Practical aids for ICT and embedded system study, for VET and continuous education are supported by the universal e-platform with direct links to industrial needs. The long term outcomes involve raising the competence of new and practicing engineers through contemporary learning tools and methods. This will lead to the development of significant improvements within VET and place European technology oriented SME companies in a better position for global competition. The consortium includes a university, vocational schools, SMEs and multipliers. Story in Estonian daily newspaper "Eesti Päevaleht"
Learning Situations are guidelines for teachers and students for acquiring integrated knowledge through practical learning processes. The Learning Situations (L.S.) 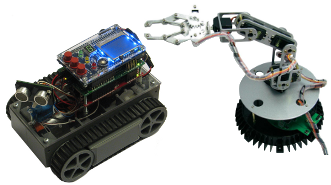 developed within the framework of this project are based upon integrating different domains such as mechanics, robotics, electronics, ICT, programming, etc. , which are the contain the fundamental nature and expected knowledge of embedded systems. The L.S. consist of a teaching methodology which includes a practical project based, step-by-step system, focusing on particular small scale systems, for example; a molding production line, a robotic manipulator, or a mobile robot for simple navigation. Remote Lab Centres are specific location-based labs which can be accessed over the Internet. A Remote Lab Center focuses on specific equipment or a series of experiments by giving online access, enabling control and monitoring of the process. Remote Lab Centres are located in different schools and offer through a resource sharing concept, different remote labs, such as; mobile robot lab, microcontroller testbed, automotive lab and smart house lab. Collaboration eRoom is an environment for hosting Learning Situations and Remote Lab Centres. 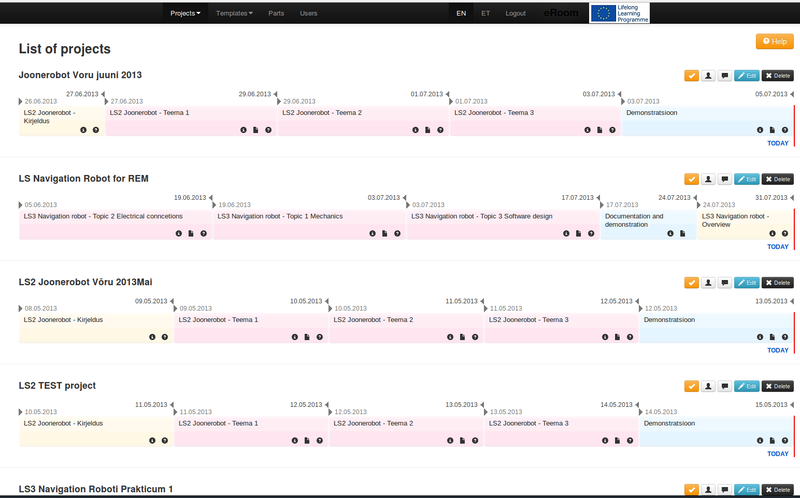 The Collaboration eRoom offers collaborational features, such as; project documentation sharing and publishing, model management and process lifetime management. eRoom enables effective use of online access features and project based learning which is ideal for international collaboration. Seminaril osalemine on registreerunutele tasuta. 2011 Oct 14, Project presentation for coordinating company employees. 2011 Dec 1, Stand and activities in Estonian EXPRO "Maailm Valla"
2011 Dec 8, Conference Network Netting "Kui uks sulgub, siis ava aken"
2013, Oct 21, Interview in a Radio Station "Kuku"
2011 Nov 23, "Scientific publication about the technological and pedagogical concepts behind the project, Mainly directed to scientific and teaching staff"
2012 March 28, Presentation of results and concepts at the "Forschungstag der Hochschule Bochum"